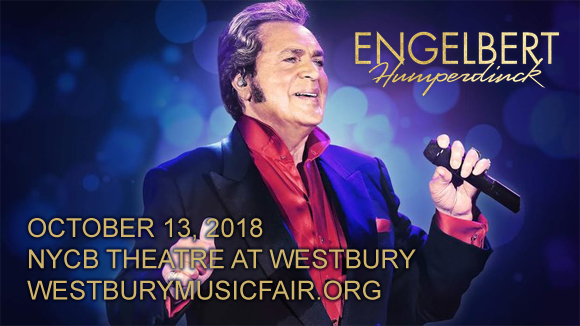 Beloved and respected the world over, veteran English singer Engelbert Humperdinck has been performing for over sixty years! The inimitable entertainer and legend of the industry comes to NYCB Theatre at Westbury on Saturday 13th October 2018 for a night of solid-gold classics, where he will be performing standards, ballads and all sorts of chart-topping hits for his adoring fans! The "Release Me" balladeer is at NYCB Theatre as part of his The Man I Want To Be Tour, in support of his newest album of the same name, released last November! Don't miss your chance to see the iconic octogenarian and incredible talent live in New York! English pop singer Engelbert Humperdinck first found fame in 1967 when his hit single "Release Me" reached the top ten in America and number one in England, spending 56 weeks in the Top 50 in a single chart run. This brought Humperdinck to an international audience and, helped by his heartthrob looks laid-back nature, made him a star. He continued his chart success with the ballads "There Goes My Everything" and "The Last Waltz", and by the end of the 1960s he had released a host of successful hit singles and albums, including Release Me, The Last Waltz, A Man Without Love and Engelbert Humperdinck. The 1970s also saw success for Humperdinck, with lavish LA stage shows, stints on television, double-platinum-selling records, Grammy Award nominations and continued loyalty from fans on both sides of the Atlantic. In 1989, he was awarded a star on the Hollywood Walk of Fame and won a Golden Globe Award as entertainer of the year. Throughout his six-decade career, Humperdinck has sold over 140 million records worldwide, and has earned 64 gold and 35 platinum albums and four Grammy Award nominations, not to mention countless other accolades.